Following Dag Hammarskjöld's death, the Staff of the United Nations set up a Committee and a Foundation to provide a "living memorial" to the late Secretary-General. The headquarters of the Foundation were established in Stockholm. 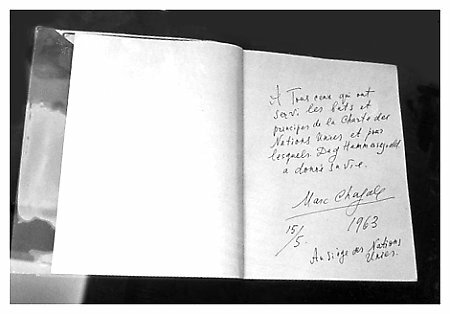 The Committee invited artist Marc Chagall to contribute a piece of his work to the memory of Dag Hammarskjöld and to all those who had lost their lives in the cause of peace. It was decided that the monument would be a free-standing piece of stained glass. 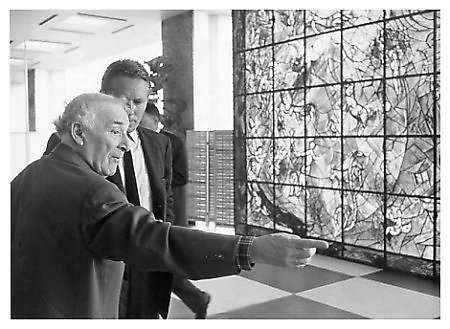 Marc Chagall discusses his art work with Secretary-General U Thant. Staff Memorial Committee Paulette Stahl looks on, 11 September 1964. 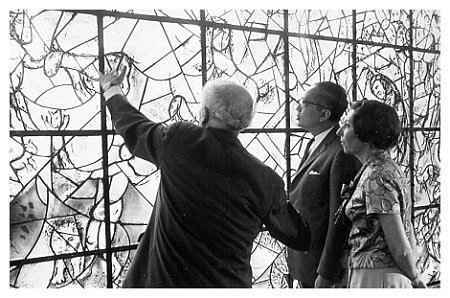 The panel was unveiled by Secretary-General U Thant on 17 September 1964. 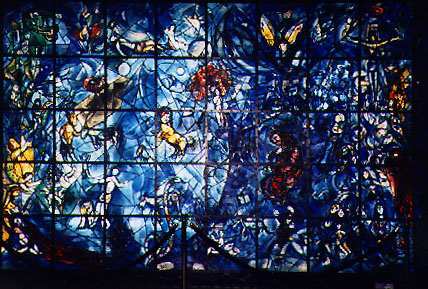 Initially placed in the south-eastern section of the lobby of the Secretariat Building, facing the East River, the "Chagall Window" was later moved to the Eastern side of the Public Lobby. The memorial, which is about 15 feet wide and 12 feet high, contains several symbols of peace and love, such as the young child in the center being kissed by an angelic face which emerges from a mass of flowers. On the left, below and above, motherhood and the people who are struggling for peace are depicted. 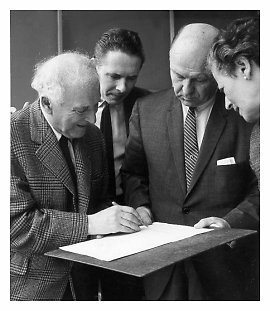 Musical symbols in the panel evoke thoughts of Beethoven's Ninth Symphony, which was a favourite of Mr. Hammarskjold's.